At Granite Selection, we know the importance of the kitchen. Whether you’re looking for ways to better compliment your black granite countertops or are looking to add black granite countertops but are unsure of what would work best, we have you covered. Leave the stress of remodeling behind with these three kitchen design ideas for your black granite countertops. Does your kitchen look like it has been left in the past? With a few simple steps, you can bring your kitchen up-to-date. There are many color schemes one can play with when designing a modern kitchen with black granite. One popular option to compliment your black granite would be incorporating stainless steel appliances, white or red walls with cherry wood cabinets. If you’re looking to design your kitchen with a little bit of old school and a little bit of new school, then the retro kitchen design is for you. The retro design would incorporate soft, neutral colors such as a bright yellow. 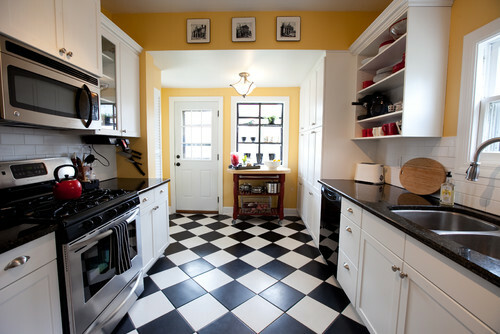 Also, one feature that is almost an absolute must is the white and black checkered tiles. If one has newer kitchen appliances, that may not blend, the usage of custom cabinetry may be used to hide such appliances to better compliment your retro kitchen countertops. 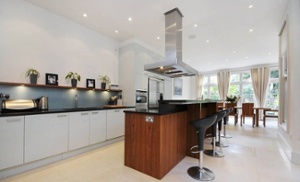 Lastly, we have the luxury kitchen design. This kitchen design unifies your black granite countertops (Black Pearl, Black Antique, Titanium) to create a more luxurious feel. 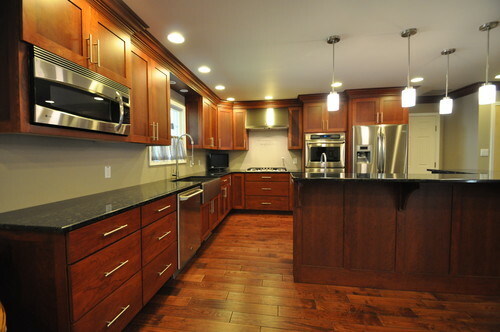 With a luxury kitchen design, one is to expect a center island with recessed lighting and stainless steel appliances. Also, a possible under counter wine cooler would also be a great touch. When looking to remodel your kitchen with black granite countertops, we are your local experts. Our team is ready to help you choose the kitchen counterop that best matches your style.